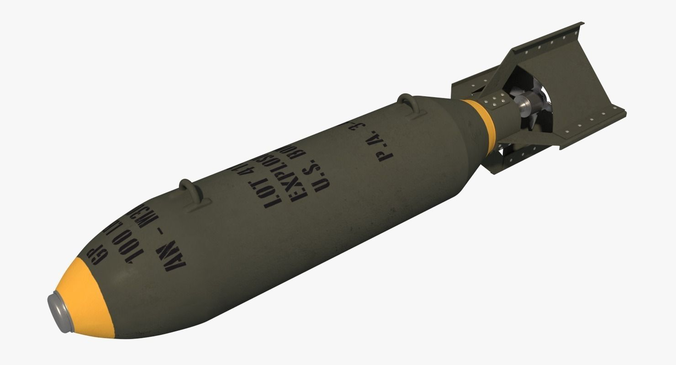 Highly detailed AN-M30 GP100 bomb. Used by the US in World War II. Includes enough detail for close up renders but still low poly enough to games. Model is made to real world dimensions. Created in Blender 3D 2.76. Also includes .fbx, .3ds, and .obj for easy import into 3D Studio Max or Maya. Includes materials for Cycles. Rendered with level 2 subsurf. Boom, there it is! Nice bomb. It's da bomb? Yeah, it's da bomb!